Villa Kimothoe is an Impressive 4 bedroom luxury villa. 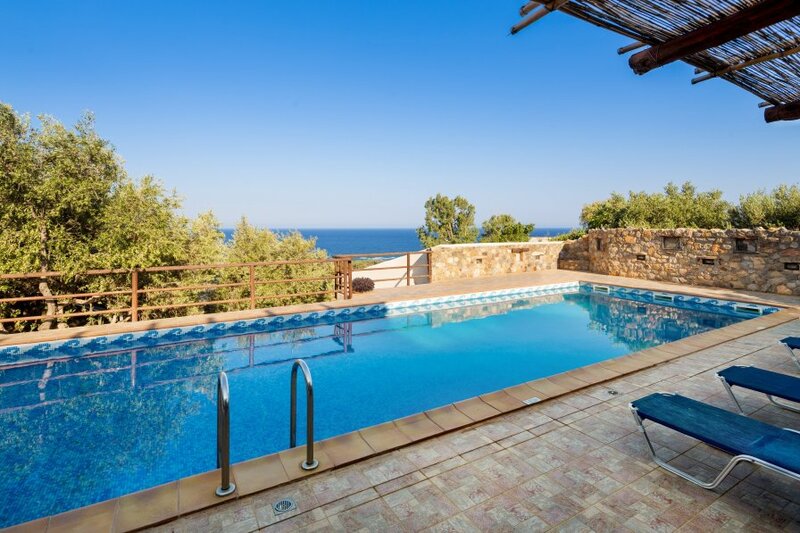 It overlooks Livadia bay on the west side of Crete. It is specially chosen by families and groups of friends. It lies like a goddess on the slope of a hill offering the most magnificent sea views. Special feature of Kimothoe villa its lavish terrace hosting the private swimming pool 13, 5 x 4,5 m & the western shaded dining area. On its south side large sea rocks create a small forest full of trees, bushes, flowers and herbs. The main entrance is on the west side which leads to a rather impressive interior. The ground floor is consisted of one twin bedroom & one triple bedroom with en-suite bathrooms. The spacious open-plan area hosts the living, dining and the fully equipped kitchen. A dark brown wooden staircase adjoins the ground floor to the first floor. There are two double bedrooms with en-suite bathrooms one with Jacuzzi on the first floor. The bedrooms have direct access to the western balcony overlooking the sea whereas only the master bedroom has access to an eastern terrace with views of the mountains, olive yards & a view of the Elafonisi Lagoon.